Since 2011, the Cornish Pasty has been given "Protected Geographical Indication" status by the European Union. This status ensures that only foods produced, processed, or prepared in the region can be labeled "true" Cornish pasties. The listed mandatory filling ingredients must be uncooked at the time of sealing the product. No meats other than beef, and no vegetables other than those listed in the mandatory ingredients are to be used in the filling. However, small amounts of other optional additional ingredients are permitted to add succulence and flavour to the pasty or to aid processing. They must not alter the overall flavour profile created by the mandatory ingredients. The combined volume of processing aids and other additional ingredients must amount in total to no more than 5% of the filling, by weight, in the uncooked pasty. Rocio is a Mexican cook, baker, author, speaker, food consultant, and researcher. She's also the founder of Pass the Chipotle a website dedicated to provide irresistible recipes inspired on the vast Mexican cuisine and offer an unique platform for specialised traders and producers to reach a broader market in the UK. She launched first foodie blog after a research project on Mexican colonial bread and an apprenticeship at a traditional bakery. She opened a micro-bakery specializing in historical breads including ancient Roman, Victorian, Georgian and Persian recipes. Her editorial work has been featured in the official blog of Mexico’s Chamber of the Baking Industry. Tinga is an easy and tasty option to make a Mexican paste, the sweetness of the chipotle and molasses gives this tomato stew a good warmth. The dough to make both Cornish pasties and Mexican pastes is exactly the same: a simple mix of flour, water, salt and shortening. Dice the tomatoes, reserve in a bowl. Slice the whole onion as thinly as possible in rings like you would for an onion soup. In a deep pan heat the olive oil, add the tomatoes, onion and garlic. You will cook them on a high heat stirring constantly for about 5 minutes. Eventually add the herbs, chipotle, sugar and salt. Lower the heat and let it simmer on a medium heat for about 20 minutes. The aim is to reduce the tomato juice and cook the dish slow and long until the tomatoes look deep crimson and the onions are absolutely soft, it should almost resemble a paste. When it's done, turn off and keep covered. Rub the shortening, salt and butter with the dough until it resembles breadcrumbs, add the water to form a dough and work until it’s smooth, left to rest, and then roll out until it’s about 3-4mm thick. Using a dish or plate of about 15cm in diameter, cut out perfect circles, before placing a generous portion - of about 4 tablespoons of tinga- in the middle of each paste. Now on to the closing of the paste: using a traditional crimping method - the twisted crimp - which aims to create twists along the edge to seal the dough. It is said that Cornish pasties have around 20 crimps. There’s a debate around the position of the crimp, while some say it should be on top, many argue it must go along the side. None of these really affect the delicious flavour of course, so you can do whatever works best for you, but the instructions which follow put the crimp at the top of the paste. To seal the dough fold both sides of the disk toward the middle, keeping the filling in the centre, and pressing both sides of the dough together firmly to form a sort crest on top which encloses the filling. To crimp: push down on the edge of the paste and twist the edges of the pastry over to seal the filling inside. When you’ve crimped along the edge leave it to rest for a few minutes before placing your pastes on a baking sheet. Given them a generous egg wash before baking at 180 degree Celsius in a preheated oven for 25-30 minutes. Remove from the oven when the crust is golden brown and allow them to cool before serving. 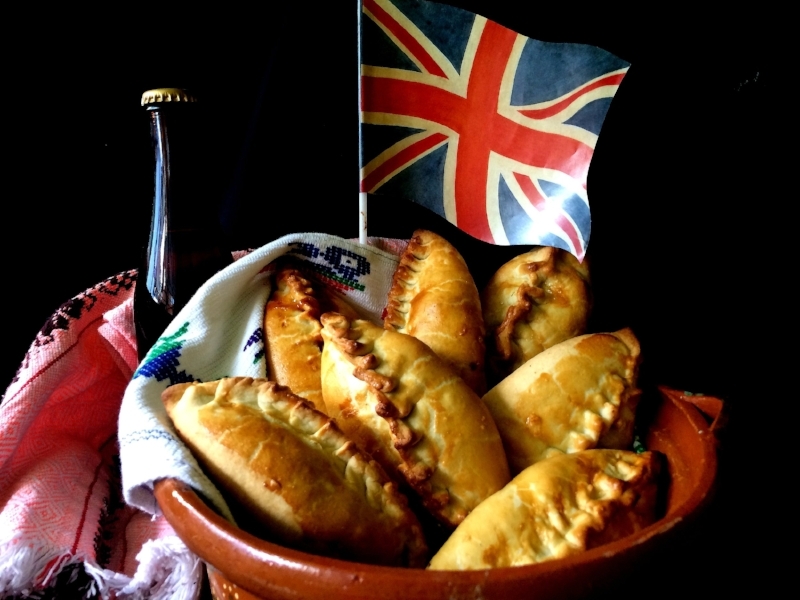 Remember: unlike Cornish pasties, Mexican pastes will require less baking time as the filling is already cooked. Thread Caramb by Blue Dot Sessions (licensed under a Attribution-NonCommercial License).